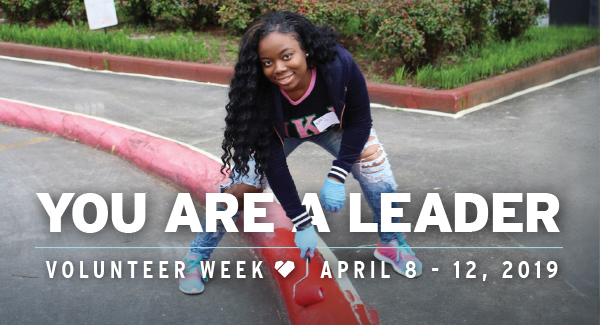 Get ready for Volunteer Week! Sign-up for a volunteer opportunity that interests you! Volunteer week is coming up and we have a lot of exciting opportunities lined up. Sign-up for a volunteer opportunity that interests you! Space is limited for some events, so be sure to sign-up right away. Once we get your information, we’ll get back to you with the details. Thursday, APRIL 11 – Diggin’ It With Us! Project: PLOT YOURSELF IN OUR GARDEN! Nature plays an important role in a senior’s physical, social/emotional, and cognitive well-being. Helping residents at Colonia San Martin attain the resources and extra hands needed for a Garden Project is an enrichment opportunity designed to promote healthy eating, and encourage outdoor exercise for residents in the community. Volunteers are needed to ready the garden for the season so everything from weeding, preparing soil, and planting seeds with children. Afterward, catch your breath and replenish with dinner and Mercy SWAG.Time: 3 p.m. – 5 p.m.
Friday, APRIL 12 – Create a Teen Space! Project: Come ready to organize and make some magic happen! Gleason Park Apartments needs your help organizing materials we have on hand, and designing a warm and welcoming space for teen residents who are enrolled in the after school program. Let’s create a safe learning environment together! Tuesday, April 9 – Creating a New Space! Project: Roll up your sleeves and get ready to flex your organizational skills. Kennedy Estates is doing a tidy-up project. Volunteers will need to help sort after school program equipment to enhance the after school program space. After all the tidying is done, help prep the new space by giving it a good clean. Afterward, catch your breath and replenish with some refreshments and Mercy SWAG. Tuesday, April 9 – READY TO SPROUT! Project: 2 garden boxes at Kennedy Estates belongs to the after school program for children K-12th grade. Nature plays an important role in a child’s physical, social/emotional, and cognitive development. Helping children at Kennedy Estates in a Garden Project is an enrichment opportunity that enhances outdoor curriculum designed to promote healthy eating, and encourage outdoor exercise for children in urban communities. Thursday, APRIL 11 –Do it for the Kicks! Project: There is nothing more exciting than an old-school game of soccer. So dust off those sneakers for an afternoon full of energy and lots of excitement with the kids of Crossroad Gardens Out-Of-School Time program. Afterward, catch your breath with refreshments of your choice and help the kids get crafty with a fun art project or two! Wednesday, April 10 – Make Friends with a Book! Project: Through story-time, help children improve their reading skills and increase their confidence and develop a love of learning and reading. Save time afterward for fun with the kiddos too! Utilize your creativity for teaching kids to make slime, crafts or an art project! Afterward, replenish with some refreshments and Mercy SWAG. Time: 2:30 p.m. – 5:00 p.m.
WEDNESDAY, APRIL 10 – Take a Special Route! Project: Our food bank could use your help! The food bank is heavily utilized, which often makes it difficult for staff to transport, move and distribute alone. Join us and roll up your sleeves to organize and help with food pick-up and delivery. Afterward, catch your breath and replenish with some refreshments and Mercy SWAG. Mileage reimbursement will be provided. FRIDAY, April 12 – Partner with us for a GARDEN Project! Project: PLOT YOURSELF IN OUR GARDEN! Help us to give our garden a facelift and add some garden boxes. Nature plays an important role in a senior’s physical, social/emotional, and cognitive well-being. Helping senior residents at Creekview attain the resources and extra hands needed for a Garden Project is an enrichment opportunity designed to promote healthy eating, and encourage outdoor exercise for seniors in the Folsom community. Supplies and volunteers are needed to ready the garden for the season so everything from weeding, trash pickup, planting flowers and constructing garden boxes will be tackled. Afterward, catch your breath and replenish with some refreshments and Mercy SWAG. Monday, APRIL 8 – Food with Difference! Project: Our food bank could use your help! Our weekly food bank is well utilized and we could use some extra hands. Join us and roll up your sleeves to help with set up, distribution and breakdown. Afterward, catch your breath and replenish with some refreshments and Mercy SWAG. Tuesday, APRIL 9 and Thursday APRIL 11 – Senior Lunch! Project: Help with the weekly meal service at The Arbor. This program helps seniors save on food costs and provides access to healthy afternoon meals that they may not otherwise have. Receive training on safe food handling practices and what to expect. Assist staff with light food prep and service. Afterward, join us for refreshments and Mercy SWAG! Saturday, APRIL 13 – AIN’T NO PARTY LIKE A BREAKFAST PARTY! Project: Think… Ace of Cakes, and put a PAN in it! We’re asking you to join us in feeding and serving our friends in the White Rock Village community. Afterward, plan to stay for refreshments and some Mercy SWAG! Monday, APRIL 8 – Feed the Need! Project: Our food bank could use your help with picking up food from a distribution site and helping to deliver and distribute it to the residents of Carter Terrace. Our weekly food bank is well utilized and we could use some extra hands. Join us and roll up your sleeves to help with pick-up, set up, distribution and breakdown. Afterward, catch your breath and replenish with some refreshments and Mercy SWAG. Mileage reimbursement will be provided.